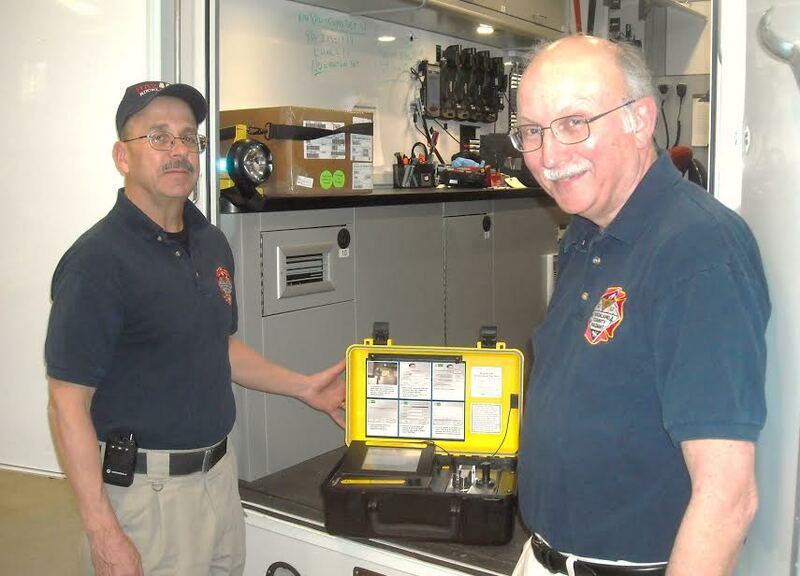 Using the equipment in the trailer, firefighters Jerry Knapp and Daniel Moran can make rapid identifications of the chemical or biological agents involved in hazardous material incidents, which are vital to the protection of first responders, emergency medical personnel and possible casualties. HAZMAT is an abbreviation for hazardous materials, which are substances in quantities or forms that may pose a reasonable risk to health, property or the environment. HAZMATs include toxic chemicals, fuels, nuclear waste products, plus biological, chemical and radiologic agents. Jerry Knapp is a 40-year firefighter/EMT with the West Haverstraw Fire Department, training officer at the Rockland County Fire Training Center in Pomona and chief of the HAZMAT team. As chief, Knapp is responsible for directing members during emergency response operations. The team responds to requests for assistance from all Fire, Police and EMS through the mutual aid system. Because RC Hazmat is a FEMA Type 1 team, members are trained and equipped to deal with any hazardous material, chemical warfare agent and other known and unknown threats. While keeping his team up to date on new equipment, improvements in protective equipment and threats can be challenging, Knapp attends national conferences to keep current on that state of the art. A hazmat suit as an overall garment worn to protect firefighters from hazardous substances, such as chemicals, biological agents or radioactive materials, according to www.chemsuits.com. The level A hazmat suit provides total encapsulation with the highest levels of protection for the skin, eyes and respiratory system dealing with hazardous levels of mists, vapors, gases and particles. It’s used when work operations deal with high risk and potential for exposure, immersion or chemical splash. It consists of a full-face piece self-contained breathing apparatus (SCBA) or a supplied air respirator with an escape cylinder. A firefighter must wear protective footwear, such as steel-toe boots with shanks on the outside of the suit. Two-way radios are worn on the inside with microphones and ear speakers for a clear communication channel. Gloves made of rubber, plastic or synthetic rubber-like materials such as neoprene can protect firefighters from chemical hazards and also reduce the risk of exposure to blood and other infectious materials. Dan Moran is a 45-year fire service veteran, a Rockland County deputy fire coordinator for Hazardous Materials and former Chief of the Suffern Fire Department. Also, he has more than 40 years in the chemical-pharmaceutical industry as a research chemist. For additional information about the Rockland County HAZMAT team, visit www.rocklandsbravest.org or call 845-364-8800.